Are you looking for a bracelet you can wear every day? Go for the Disc Bracelet in Sterling Silver and you won’t be sorry! 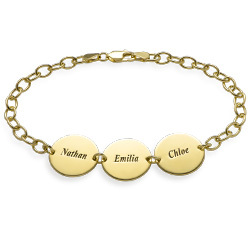 This exquisite piece of personalized jewelry is an amazing way to show the world how much your family means to you since you can engrave the name of a family member on each one. If you’re feeling whimisical, choose to inscribe meaningful words on the discs instead. You can add up to three flat discs to the gold plated chain bracelet.